Fundrise Reviews - Is it a Scam or Legit? By allowing you to gain direct access to high-potential, private market real estate investments, Fundrise’s simple, end-to-end eDirect technology promises to represent a real alternative to investing in the stock market. In fact, by combining this technology with new federal regulations, the site claims it might be the biggest change in the industry since the invention of the mutual fund—one that could deliver up to 30-40 percent higher expected annual returns than a traditional public stock portfolio. Together, Fundrise claims they’re revolutionizing the investment industry and rebuilding it from the ground up, with low-cost advising and having invested more than $1.2 billion in real estate since opening their doors. But will they help you create a better financial future? Keep reading, and we'll help you answer this important question by discussing what we learned during our research. How Does the Fundrise Investment Process Work? Supplemental Income – If you have a moderate time horizon, prefer low variability, and are interested in a consistent passive income stream. Balanced Investing – Moderate-to-long time horizon and low variability, this is focused on broad diversification. Long-Term Growth – If you’re looking for some income but are also interested in earning higher returns over a longer time horizon, with moderate expected variability. In short, by combining your investment with tens of thousands of individual investors, they claim to bring you the same leveraging and buying power typically only offered to large institutions, without the high fees. Another meaningful difference is that their Internet public offering (IPO) model also claims to allow investors to become shareholders of the company. Acquire – Fundrise focuses on “commercial real estate properties of institutional quality but sub-institutional size,” whose value can be enhanced. Cash Flow – Created from a combination of potential profits, rental income, and interest payments, and then paid pro-rata to each investor as a shareholder. eREITs are offered directly to investors online, and are intended to provide consistent quarterly cash distributions, as well as additional returns paid out at the end of each investment (typically after five years). Buy – Focus on high-growth neighborhoods in major U.S. cities where property is available to develop and sell homes. Develop – Fundrise constructs these residential properties based on projected homebuyers’ needs. Sell – After completion, homes are sold and any profits are returned to investors. What will you pay to invest in Fundrise’s eREITs and eFunds? How Much Does It Cost to Invest With Fundrise & How Much Could You Earn? eREIT and eFunds carry a $1,000 minimum investment. They’re offered to accredited and non-accredited investors directly through the company’s website, so there aren’t any broker or selling commissions. 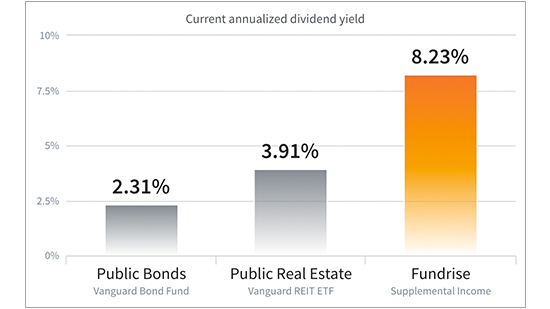 While a full description of potential fees can be found in their Offering Circulars, Fundrise investors pay up to a two percent asset origination/acquisition fee, along with a 0.85 percent annual asset management fee. Those who utilize both the investment services and management system will pay a 0.15 percent annual investment advisory fee. Together, the company claims their direct-to-investor model could help you save 20 to 40 percent compared to traditional options. The Fundrise platform provides direct communication with investors, including ongoing reporting and updates on the status of investments, along with the delivery of tax filing and other relevant materials. What Are Investors Saying About Fundrise In Their Reviews? Since writing our original article, three HighYa readers have provided their feedback about Fundrise, giving the company any average rating of five stars. Compliments related to their transparent business model, open communication, consistently high returns, ease of use, and property diversification. The Washington, DC-based company seemed to come with similar feedback elsewhere online, with an A+ Better Business Bureau rating and no closed complaints as of 7/12/17. The company has been in business since 2011, although they’ve recently overhauled their brand and have seemingly distanced themselves from the “real estate crowdfunding platform” they previously advertised. Fundrise is headed by founder and CEO Ben Miller, who, according to his bio, also co-founded the Popularise real estate crowdsourcing site. He’s also managing partner at WestMill Capital, and principal at US Nordic Ventures. Together, he’s financed more than $500 million worth of property. 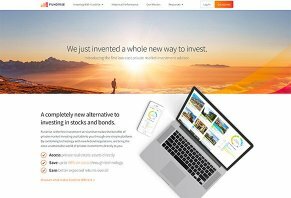 Are There Other Online Real Estate Investing Companies Like Fundrise? If you’re looking for similar end-to-end technology, low fees, and eREIT and eFund products, this is a distinct combination you’ll only find with Fundrise. However, if you’re open regarding the specifics, there are several other peer-to-peer (P2P) real estate investment network out there, including popular options like RealtyMogul, Realty Shares, iFunding, and Patch of Land. Given these similarities, how can you choose the right option? Fees & Average Returns – Are their fees higher or lower than competitors? What are you getting for your money? What kind of returns have they delivered in the past? How do the estimated returns compare to actual ones? Site features, menus, and options – Does the website feel comfortable to use? Does it provide easy access to a wealth of information? Can you quickly learn a lot about your holdings? Investing ease of use – Is it easy to sign up, transfer money, and execute paperwork? Communication and customer support – Do you receive timely information about your investments? Is someone available to answer questions? Financial backing – Are they receiving financial support from big public and private companies? This could indicate that they’re really onto something. Opportunities – Do they regularly update their listings, or is it erratic? Taking all of this together, where does this leave you in regards to Fundrise? Overall, based on what we learned by analyzing the company’s site, as well as from reading third-party online feedback, it appears that Fundrise offers unique products, low fees, traditionally higher-than-stock-market returns, a positive reputation with customers, and a clean, user-friendly experience. Will they ultimately represent the “best” P2P real estate investing service? As long as your needs align with their offerings, while we didn’t try them firsthand, we certainly could foresee this as a possibility. Before you go, share you experience with Fundrise so other real estate investors can make more empowered decisions. Make sure to read ALL the fine print. It's great in the sense you can invest without knowing a lot about investing. The money slowly starts growing immediately, which is nice. The thing I find to be a major con is if you need to withdraw funds, it takes over two months to get your money. I've had several investment accounts and have never seen this kind of delay. Be aware before you put your money here - if you have any urgent need, and require your money back, this isn't the account to expect to receive it from in a timely manner. I can see taking a week, even two, but over two months seems absurd. With all due respects, if a company pays and in most aspects is reliable, I can’t see the reason why should avoid them. The last years I’m making my living depending on projects that provide me passive income. Sounds good about this and if the only issue is their delay on a refund or redeems, then I think it is fair enough. If you feel that you need more immediate payouts feel free to ask me. If you want to go with them, then go with them. Your comment isn't really helpful. The review was in regards to my opinion, which I stated. If yours differs and you'd like to review the company, go for it. I put honest feedback in my review regarding my experience. I don't know you, which means I can't trust you with something as vital as finances. I really appreciate your review, sir. I'm a young boy and have been searching for opportunities like this for a while now. Can you mention any other trusted companies or other legitimate opportunities I can go into? In your review, you mentioned that you "....had several investment accounts" This is my email n.lakpab [at] yahoo.com. I will really appreciate your help. My Fundrise review thus far has been very positive. I started with them about three months ago now, and I've found the entire experience to be very well run and professional. If I have any questions, they are quick to respond, and everything overall is well documented and easy to understand. Overall, I have a good sense that this operation is run very tightly and working with them is a good investment. So far, my experience with Fundrise has been really great. They are very transparent in terms of investments made, along with supporting information. Also, communication is good, and you're kept in the loop about the progress of your portfolio development. Also, I like their new concept where you invest along risk/growth preferences. I have been using Fundrise for almost two years now and have gotten approximately 10% returns consistently. I would love to hear the experiences from other users, but I have nothing bad to say about it. It is so simple; put money in and grow your account. I honestly didn't think it could be real. I thought it was some kind of electronic Ponzi scheme so at the beginning I was careful and tested it, but the SEC is on every move that they make, and it's all backed up by real properties and not strip malls or heavy retail that could be killed by Amazon. These are senior facilities, apartment buildings, condos, townhomes, and hotels; places designed to generate revenue. I have nothing negative to say about this company, and have yet to find someone that has has a bad experience. Hey, have you ever withdrew money from Fundrise? How long did it take? Fundrise is the real deal. Excellent returns on great projects. I've been investing through Fundrise for four years. Every investment has paid out at least 10% annually, and I've really learned a lot about real estate development from their education section. Hi Mr. Erlich. I was just curious when you wrote that "at least 10% annually," would this mean they would even go higher if you invest more? And if so, can you please give me a rough idea about how much more percentage they would be willing to pay dividends. Write a Review for Fundrise!